The cop warns them that they are about to get "shot". James Fallows wastes a paragraph quoting someone who wonders what that might mean. Meanwhile the kids are telling each other to cover their eyes. They know exactly what it means. Of the number of people screaming about this, what percentage have said anything about Egypt? The students have a case [they should win it] but I'm not sure I agree with the decision as a matter of law. The protesters' original interest was in saving trees not changing law. What happened to the trees? 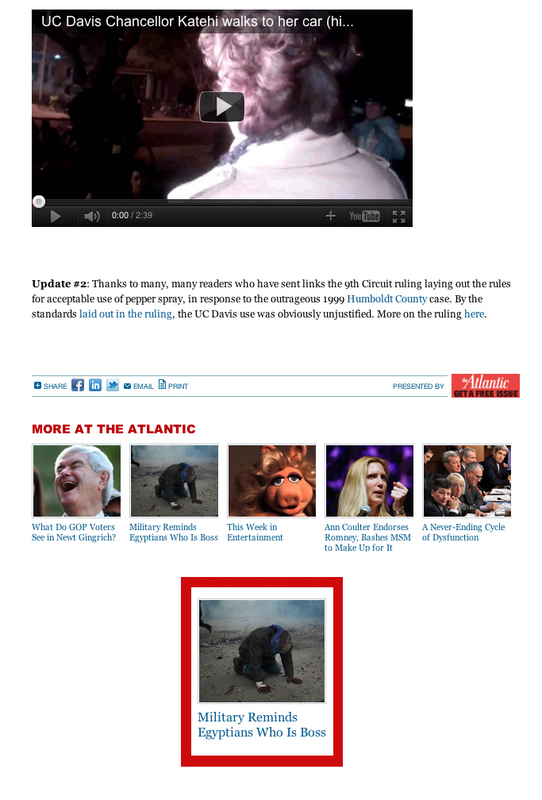 The headline for Fallows' piece reads: "The Moral Power of an Image:" This is what ran below it. I outlined the important bit in red. Politics being sidetracked by law is one thing, Josh Marshall worries about politics getting sidetracked by bigger politics. Last week I met a person heavily involved with OWS in New York. And I told him that something seemed to have changed in the previous couple weeks — basically that the dominant imagery had become about confrontations with the police rather than the core economic messages which had been more dominant previously. In most cases it didn’t seem to be the fault of the OWS protesters. It was peaceful or mainly peaceful protests getting met by excessive police responses. But still, at the level of imagery and message, the end result can be the same. And in this case, I’m not talking about the ridiculousness and movement-character assassination on Fox News. I’m talking about coverage that lacks that sort of committed bias. Something similar is at play with this pepper spray incident at UC Davis. Yes, this is horrific. And in my mind at least it puts a spotlight on a more general trend in the country — which is increasingly tech-based and/or militarized policing strategies. But how much do the acts of the campus police at UC Davis have to do with economic inequality and the ownership of the state by the super wealthy? Unless you’re up for a Chomskian analysis of our present moment, pretty little, I think. And a lot of the people I talk to in OWS totally get this. ...A number of longtime readers wrote in over the weekend saying things to the effect of ‘I’d been equivocal on OWS until now but seeing these images have galvanized me, made me think it’s a fundamental moment for the country or that this is an iconic moment, etc.’ ...But again, an iconic moment about what? The issue of police brutality and militarized or quasi-militarized policing is a legitimate and very important issue, entirely unto itself. But the the campus police at Davis or the NYPD for that matter aren’t what’s driving the rising inequality of American society. I've never before thought of Josh Marshall as stupid.